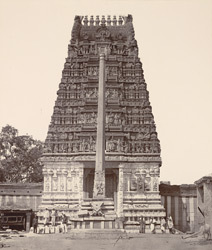 This photograph of the Someshwara Temple, Ulsoor, Bangalore taken in the 1890s by an unknown photographer, is from the Curzon Collection's 'Souvenir of Mysore Album'.The note attached to this photograph reads, "The temple, with its imposing gopara, appears to have been erected by Kempe Gauda in about 1570 A.D. The story of its origin is that Kempe Gauda, fatigued by hunting, rested under a tree and fell asleep on the present site of the temple. The god Somesvara appeared to him in a dream, revealing the existence of a hidden treasure and bidding him to build the temple with it."